Several years ago, shooters who sought to get their feet wet in long-range shooting competitions chose a hunting rifle with a heavy barrel or one with tactical or military sniper heritage. At the time, chassis-style rifles were a high-end affair. Today, due to the popularity of precision rifle competitions, major firearms companies have taken notice and offer introductory level rifles designed from the ground up with the bells and whistles needed for precision shooting. One of the newest entries into the arena is a unique collaboration between Smith & Wesson’s Performance Center and Thompson/Center on a chassis precision rifle called the LRR, or Long Range Rifle. 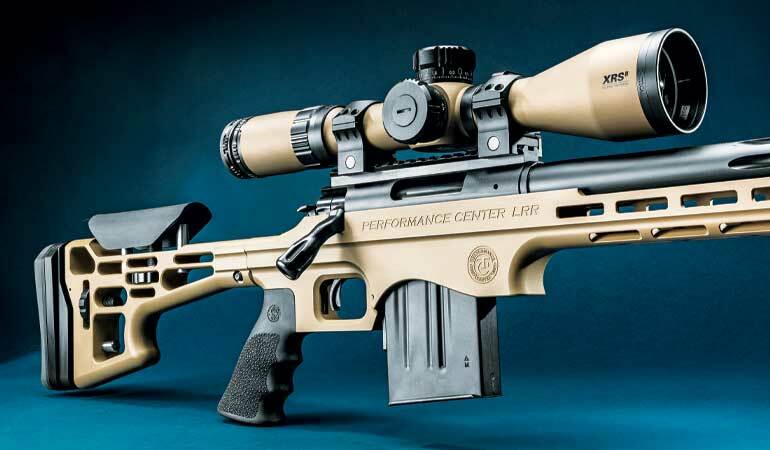 The collaboration may seem like an odd marriage since, until now, the Performance Center didn’t have a bolt-action rifle in its stable, but it makes sense when you look at the bigger picture. Performance Center is known for taking a Smith & Wesson firearm and hot-rodding its performance. 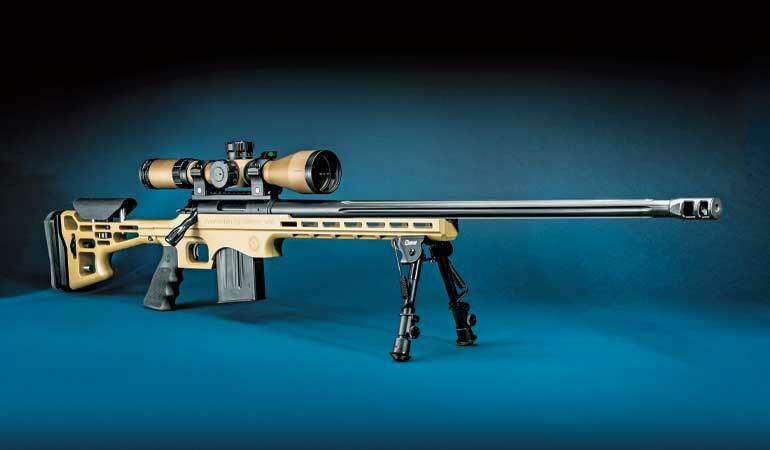 Thompson/Center’s rifles are known for packing high-quality features into budget-minded bolt-action rifles. Blending these respective specialties—and in case you didn’t know, Thompson/Center is owned by Smith & Wesson—has created a feature-rich precision rifle with details designed for high performance. Of the entry-level chassis-styled rifles available on the market at this price point, the LRR is one of the most affordable and unique. The LRR I reviewed was chambered in .243 Win., but it’s also available in 6.5 Creedmoor and .308 Win. It has a 26-inch fluted barrel with 5R rifling, a removable muzzle brake, a Performance Center adjustable trigger, fully adjustable stock, and a 20-m.o.a. Picatinny rail scope mount base. The trigger is adjustable from 2.5 to 3.5 pounds. 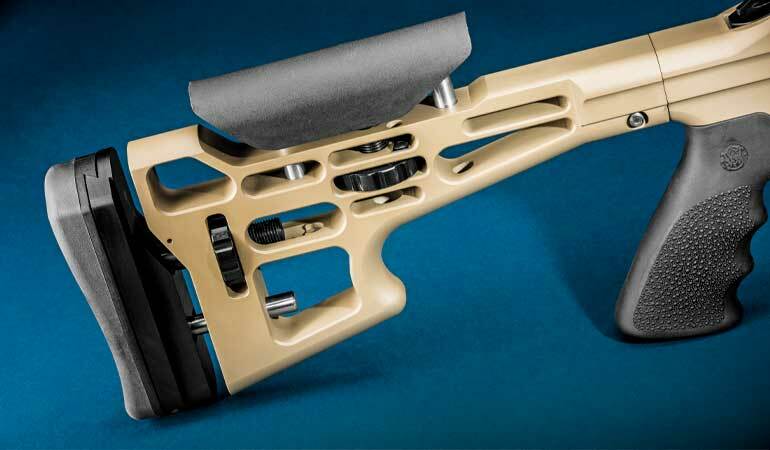 The rifle sans scope or magazine weighs 11 pounds, seven ounces and includes an AI-style magazine. The flat dark earth chassis is one piece from receiver to fore-end tip, and the action incorporates an adjustable trigger from Performance Center. The rifle feeds from AI mags. One of the first things that caught my eye is the overall design. It eschews the trend (for this price point) to design a rifle with an AR-style buffer tube and offering it with an off-the-shelf AR stock. The aluminum chassis is one piece from the receiver to the fore-end, and all the contact points are rounded. The LRR’s multiple point M-Lok slots allow attachment of multiple rails for near and far bipod locations, barrier clamps, tripod plates, and extra round holders—common accessories for today’s precision rifle competitions. The LRR’s fully adjustable stock gives you all the adjustments you need for a great fit. It includes adjustments for length of pull, cheekpiece, buttstock cant and stock-pad height. The length of pull is 13.25 inches and can extend an additional 1.25 inches. The cheekpiece has a 0.75-inch rise that was plenty even for the 50mm-objective scope I mounted with low rings. The buttstock and cheekpiece each sit on a threaded post and are adjusted via a wheel with indents. The indent stops are 1/16 inch apart and deep enough to prevent accidental adjustment. The designers went a step further and included locking screws to secure the cheekpiece’s post in place. Another nice little touch is a threaded hole to attach a monopod on the rear base of the stock. The stock is not only fully adjustable, but also detachable, and this aspect is well done. If it wasn’t for the vertical line behind the receiver, you wouldn’t realize the stock can be removed. The fluted barrel is a match grade barrel 5R rifling and sports a threaded muzzle with a tank-style two-port muzzle brake. It’s refreshing to see a muzzle brake at this price point; companies usually leave the added cost of it to the buyer. 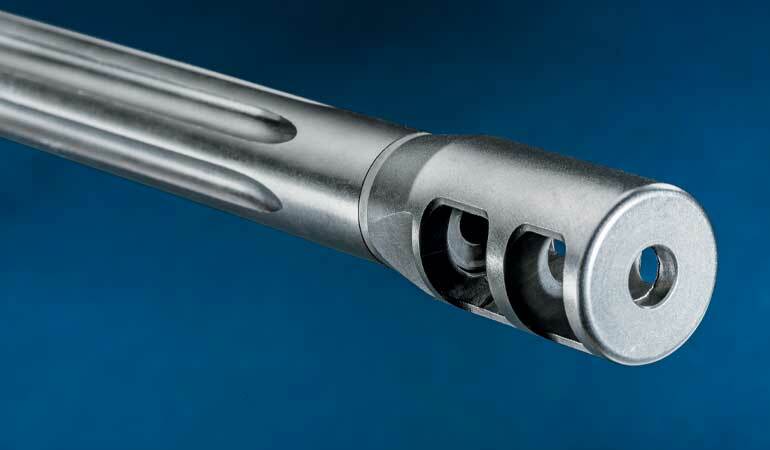 A fluted barrel can be beneficial by reducing weight while maintaining some of the stiffness of a heavy barrel. The fins also help dissipate heat. The degree to which this helps accuracy depends on many factors and is up for debate, but there’s no downside for a fluted barrel on an entry-level precision rifle. The LRR’s fully adjustable stock enables shooters to set length of pull, cheekpiece, buttstock cant and stock-pad height. The addition of 5R rifling is beneficial because it deforms the bullet less than traditional rifling, and fewer deformations mean better aerodynamics and better accuracy—and the longer distance you shoot, the more this matters. For me, getting my hands on the controls of a rifle is like getting behind the wheel of a car and learning how it brakes, how it accelerates, how it handles. In the case of a rifle, I want to know how short and crisp the trigger is and how smoothly the bolt runs to get off the next shot. The Performance Center trigger is a bladed trigger that arrives set to two pounds, 11 ounces, and it is smooth and crisp. Running the bolt was smooth and fast, its three-lug push-feed design with a short 60-degree throw allows for quick cycling. The lugs engage positively, and the bolt rotates smoothly. The bolt arm and bolt handle are a one-piece design. Initially, I wasn’t crazy about the Hogue overmolded grip with finger grooves. I normally don’t like finger grooves because I rarely find the spacing comfortable, but the grooves were spaced just right and allowed my fingers to flow naturally around the grip. The safety is a rocker-style, two-position unit that locks the trigger but allows the bolt to retract freely. The 26-inch fluted barrel is match grade and features a threaded muzzle with a tank-style two-port muzzle brake installed. Fitting the rifle to my body was easy, although initially the 1/16-inch increments of the cheekpiece dial were a bit of a chore when trying to make big changes. But the finesse controls paid off because I was able to get my eye centered behind the reticle. I really liked the ability to adjust the height of the stock’s buttpad because it allowed me to establish solid contact with the whole stock pad. I mounted Bushnell’s XRS II 4.5-30x50mm scope on the rifle. With a street price of $2,250, the scope is double the price of the LRR, but it’s a one-time investment that won’t need upgrading even if you buy a custom-built rifle in the future. The XRS II is a first-focal-plane scope and is available with the G3 or Horus 59 reticle. During my testing I found it to track accurately. It has ED Prime glass for excellent light transmission. It’s waterproof (IPX7), fog-proof and has an EXO barrier coating on the lens to repel water, dust, and oil, and to prevent scratches. The scope also includes one of the easiest zero stops to set. Once you’ve zeroed, remove the elevation turret, loosen the three Allen screws on the zero stop, and let the ring drop to the base. Secure the Allen screws and replace the turret cap. Once I set up the fit of the LRR and did some dry-firing, I was ready to send copper downrange. The rounded corners throughout the frame and stock let my hands transition smoothly around the rifle without catching on any hard edges. The only hard edge on the rifle that I was highly aware of was on the cheekpiece. My cheek rested close to the rear of the cheek pad, which has a mildly sharp edge and I could feel it dig in. If this was my rifle, I’d would have removed the hard edge with a fine sandpaper. I performed accuracy tests from a concrete bench using a Bulls Bag shooting bag. I shot five five-shot groups for each bullet type and let the barrel cool and cleaned it between ammo types. The LRR comes with an m.o.a. guarantee—a three-shot group measuring better than an inch at 100 yards. 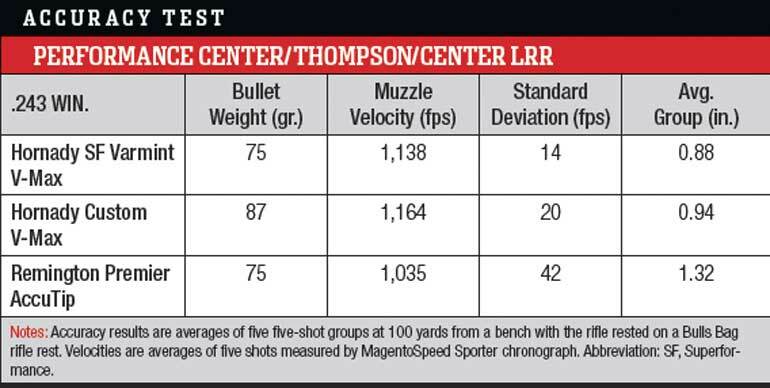 As you can see in the accompanying accuracy chart, some ammo shoots better than others, but two of the three loads met the guarantee—and that’s on average as opposed to just a single group. You might be wondering why this rifle is offered in .243 Win., a caliber steeped in hunting history. Well, it’s also an effective long-range round. It is the caliber of choice for John Whidden, a long-range shooter with many championships under his wing. Whidden, like many long-range competitive shooters, develops his own custom loads. I have to mention the accessories that come with the rifle. I was particularly impressed with the soft rifle case, a nice addition for a rifle at this price point. The case is a heavily padded nylon soft case. You won’t have to worry about dinging your scope when packing your gear unless you drop an anvil on it. The rifle compartment includes two hook-and-loop straps and angled pockets on each end to keep it tightly secured. On the side of the case are four magazine-sized pockets that sit atop a larger zippered pocket. Opening the pockets felt like Christmas. In them I found a 10-round AI-style metal magazine, a rifle strap with HK-style snap hooks, and am M-Lok compatible Caldwell Pic Rail XLA fixed bipod. The rifle strap doesn’t include the sling-attachment mounts, so you’ll have to purchase those separately. This is one smooth rifle, from the crisp trigger to the effortless bolt travel to the rounded edges on the chassis. Shot after shot, it was a pleasure to shoot. Like other Thompson/Center Arms rifles, it’s packed with features way beyond its price point, and like Performance Centers firearms it’s fine-tuned for performance. Paired with the right ammo, the LRR has all the right stuff to get you shooting out to 1,000 yards and beyond. You won’t find a competitively priced chassis rifle that can match its features, quality or attention to detail.